DRAW #19 is FINALLY at the printer, and sports a new cover color scheme for its final incarnation. Also new to DRAW is the triumphant return of DANNY FINGEROTH and BOB McLEOD (former editors of our dear, departed magazines WRITE NOW and ROUGH STUFF). Danny’s helming a new regular feature spotlighting the top Writer/Artists in comics, while Bob is continuing his extremely popular “Rough Critique” of newcomers’ work that he began in Rough Stuff. Editor Mike Manley is of course on hand as usual, this time with a feature-length article and demo by Doug Braithwaite. 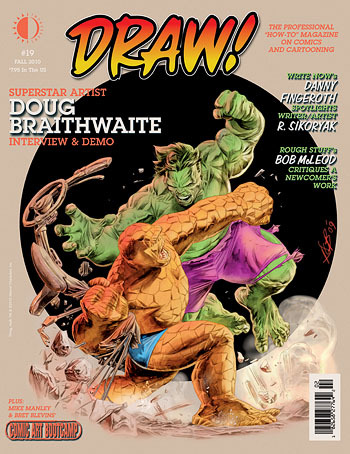 This preview features several pages of Mike Manley’s feature on Doug Braithwaite, a section of Danny Fingeroth’s interview with writer/artist R. Sikoryak, and the complete “Rough Critique” by Bob McLeod. DRAW #19 will be on sale in comic book stores on Wednesday, September 29. This entry was posted in TNT on 9 September 2010 by Mr. Morrow.